Linux has evolved and so is its software base. However, sometimes you wish you could use the Windows application on Linux that has still not been ported to Linux platforms. There are some applications exclusive to Windows like its Office suite which will never be ported to Linux. There are tens of thousands of applications and Games that are more of made-for-Windows. For example, Adobe Photoshop is still not available to Linux users and you can't play Counter Strike on your Linux system. Is their any way to run Windows Application on Linux that are not available. Yes, there is a solution. You can use WINE to run windows applications on Linux. WINE is an acronym for "Wine Is Not an Emulator" and is a compatibility layer capable of running Windows application on Linux systems.Wine enables Linux, Mac, FreeBSD and Solaris systems to run Windows application without owning a copy of Windows. WINE is an open source and free software. Approximately, half of Wine's source code is written by volunteers with help from some commercial sections like CodeWeavers. Why not to use VMWare to install Windows within Linux? Well, you can always install any Virtualization software to install Windows Operating System and install and use applications that are not available in Linux. However, there are some restrictions. Using Virtual Environment will eat up your resources to a great extent. Plus you still need to buy a genuine copy of Windows OS in order to use it. Download Wine for your system. 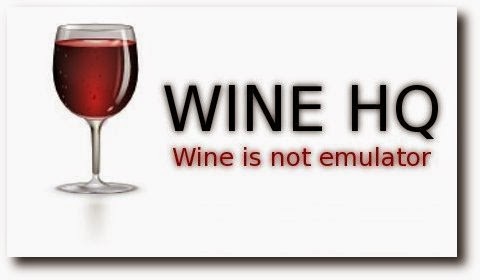 You can download Wine from the http://www.winehq.org/download/. 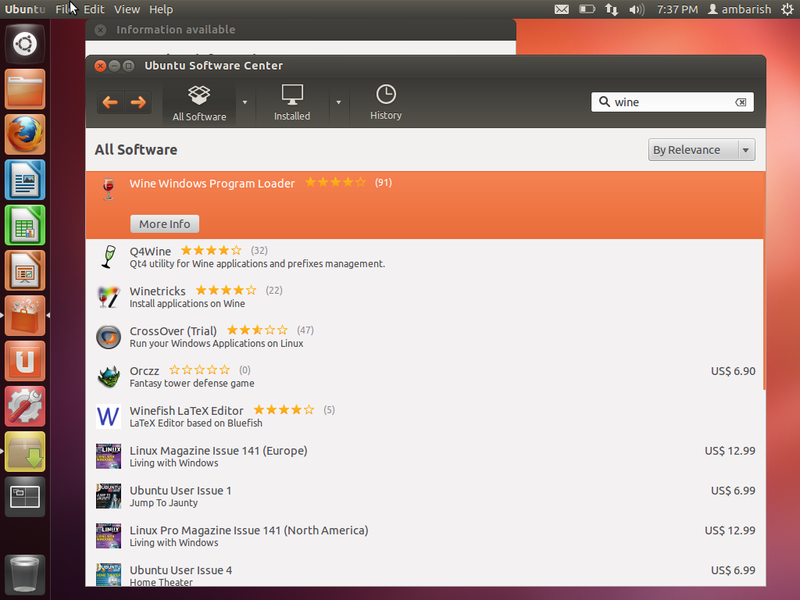 Alternatively, you can search in the Ubuntu software center and search fro WINE to install it. At present the stable version is wine 1.6.2 and the beta version available is wine 1.7.19. Windows Application that you can run on Linux. There are 21297 windows applications that can be run on Linux and the list is growing. There are 3 categories under which the software are grouped - Platinum, Gold and Silver. Applications which install and run without any problems and flawlessly on an Wine installations are grouped under Platinum. Gold list apps are those which run flawlessly with some special configurations. Silver list includes applications that can be run with minor issues that do not affect typical usage. Microsoft Outlook 2010 (32-bit) etc. You can see the complete Windows Application list that can be run on Linux with the help of wine are listed on Wine App Database. These applications are categorized in the Platinum, Gold and Silver. Which software applications you are running through wine and how's it working? Do share with our readers. I have always personally loved Linux, but the use of Windows and Windows software in the Enterprise and Corporate world forces us to be tied to it. Wine, although it works, is far from being able to perfectly run windows programs. More work needs to be done on it. Hi Isaac. Yes, Windows is too much into our personal and professional lives that we are tied with it. Wine is still not as perfect to run everything, but its a nice attempt to fill the voids that the Corporate sector has created by distancing from the Open Source World. If its free, no one will benefit. That's what they don't want.